Military Class Rings designed for all branches of the Armed Forces. Custom Military Class Rings fully personalized. FREE Shipping on selected rings. While looking for a military ring, there are a lot of different options to choose from. Unlike other regular rings, bracelets or necklaces, a military ring should not be bought from any average jeweler. Most of the jewelry stores don’t customize military class rings. As a result, the jeweler will try to sell you something from the stock, which may be completely useless for you. Usually, you would want a military ring to display a tour of duty, deployment or an important unit crest. In this article, we will tell you how to make sure you get the best military ring as per your requirements. It is always better to look online for military rings. You can also use a military shop if you are on a military installation. While looking online, you get to see a wide range of military rings belonging to the US Navy, the US Military, the US Air Force and the US Marines. Most of the websites on the internet give you a chance to design your own rings. They have a ring designer program that makes it easier for you to customize a ring according to your requirements. It is very easy to design military class rings on your own. However, you need to consider some important things. First of all, you need to determine the type of metal you want to use. You should also choose the stone color and wordings which you want to be imprinted around the stone. It is also important to select side emblems. Emblems should be appropriately chosen to reflect your field of duty and service. 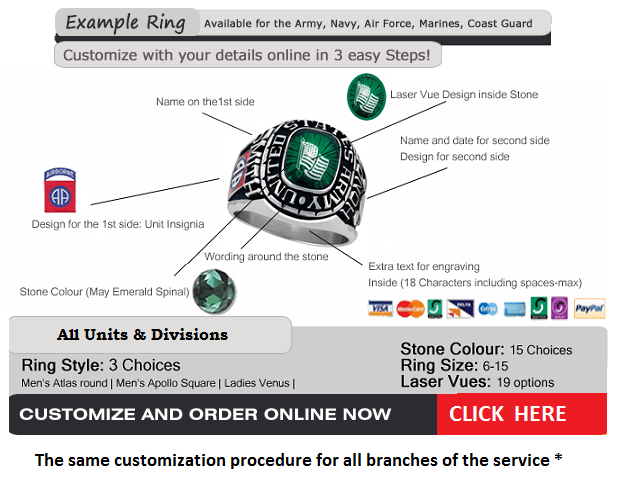 At a website, it becomes very easy to use the step-by-step guide and design a customized military ring. The cost of designing is also very affordable. Almost every website has designs for both men and women, who have been associated with defense services. Deployment rings to commemorate big deployments like ‘Operation Enduring Freedom’ or ‘Operation Iraqi Freedom’ have always been popular. Once you design a military ring and order it, you and your family will be able to treasure it for years to come. There are hundreds of designs you can choose from. Moreover, these hundreds of designs can be used to make thousands of combinations to customize your military ring. You can work on both sides of the ring. Therefore, possibilities are endless. There will be two emblems on both sides of the ring. All quality military class rings have the name of the wearer on one side and dates of duty on the other. The inside of the ring may include a personalized message like an army motto, name of a fallen colleague and so on. It is always better to buy military rings online. You get a lot of options to choose from and the prices are affordable.